Rotary turned 100 years old in 2005. This event was celebrated by Rotarians in a uniquely Rotarian way: through service to the community. The Rotary Pavilion is a 2000 square foot picnic shelter that is located along the bike trail and next to Ohio State Newark’s Titan Field. There is also a newly added smaller picnic shelter and picnic pods. Located nearby are handicapped-accessible restroom facilities, a paved parking lot and driveway and several picnic tables. The fully-accessible playground sits nearby. The playground equipment and rubberized surface surrounding are wheelchair-accessible so that children of all abilities may play and learn together. First built was the large Rotary Pavilion in 1998. This undertaking would turn out to be a very Rotarian-driven project: the architect, general contractor, and electrician selected for the job were all Newark Rotary club members. Construction began on the pavilion in July of 1998 and it was dedicated on October 6, 1998. In 2004-05, Rotary International was celebrating its 100th year. Local clubs were encouraged to establish a centennial committee and develop a community project as early as 2002-03 in honor of this significant milestone. 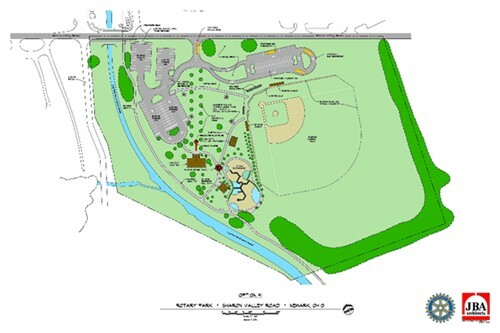 In October of 2004, the proposed project, an accessible playground where children of any ability could play alongside each other, was approved by the club. The playground was to be situated next to the Rotary Pavilion on the grounds of Ohio State Newark and COTC on Sharon Valley Road. 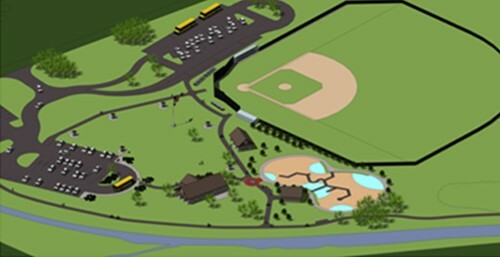 The park would feature playground equipment that could be used by children of any ability, including those in wheelchairs. There is a rubberized surface for safety as well as accessibility. The playground is accessible to the already existing bike path and wheelchair-accessible restrooms. Ground was broken in June of 2005 and the park completed by October of 2005. 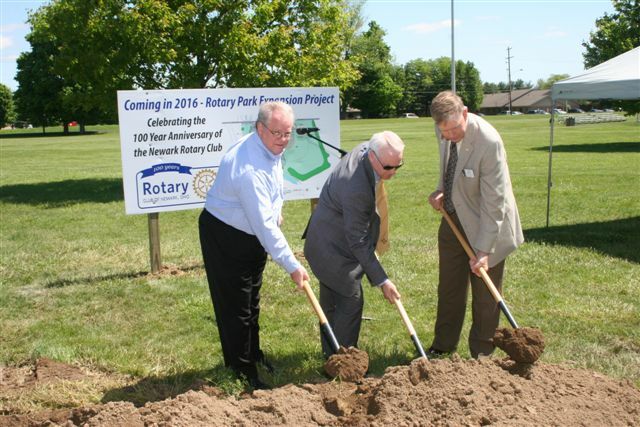 To celebrate its own 100th anniversary in December 2016, the Newark Rotary Club expanded Rotary Park on Sharon Valley Road in Newark, including improvements to the popular Rotary Accessible Playground built in 2005. The goal of the improvements is accommodating more groups, expanding parking and creating a new, safer entrance off Sharon Valley Road. Newark Rotary members unanimously voted to proceed with the estimated $500,000 investment. A new, smaller pavilion (first-come, first-served) would be built along with six picnic pods with seating for up to 12 people each. The new entrance has been lined up with the Lou and Gib Reese Ice Arena entrance, in coordination with the City of Newark, and lead to a third parking area featuring 175,000-square-feet of additional parking. 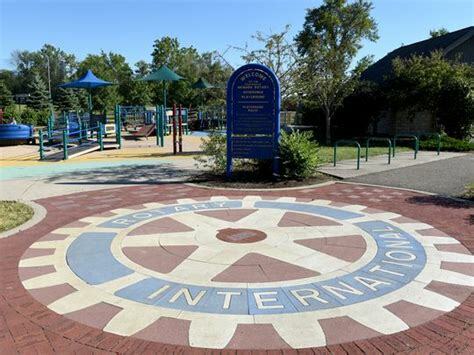 The long-term management and maintenance of the space is provided by The Ohio State University at Newark and Central Ohio Technical College.The Rotary Club of Newark, through its Board of Directors, built an Accessible Playground for all young people in our community. As such, the design features special equipment and ramps that enable children regardless of mobility to enjoy the playground. The location is on the campus of The Ohio State University at Newark and Central Ohio Technical College and placed adjacent to the Newark Rotary Pavilion. The site features a 100-car paved parking lot and restroom facilities, and provides easy access to the bike path. To reserve space at the Rotary Pavilion, contact The Ohio State University at Newark & Central Ohio Technical College.